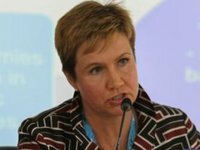 The World Bank backs a model of introducing the exit capital tax for small- and medium-sized enterprises (SME) proposed by the Finance Ministry of Ukraine, World Bank Country Director for Belarus, Moldova, and Ukraine Satu Kahkonen has said. Kahkonen said that the alternative proposed by the Finance Ministry to replace the profit tax by the exit capital tax for companies with income of up to UAH 200 million is a way to cut the budget loss. In turn, the Finance Ministry said that in order to avoid a threat to fiscal stability, it is necessary to introduce the exit capital tax for SMEs with an annual income of up to UAH 200 million and the use of a compensator in the form of a conditional payment of the exit capital tax in advance in the amount of 50% of the sum of tax liabilities for income tax for 2018 only for this group of taxpayers. "In this case, 95% of the total number of legal entities will go to the payment of the exit capital tax and get benefits from this tax. About 4,500 companies with annual income of more than UAH 200 million, who declared 85% of the total amount of tax, remain taxpayers of the profit tax," the ministry said in the press release. At the same time, the Finance Ministry said that this model was discussed with the International Monetary Fund (IMF) and was agreed upon as possible. One of the authors of the bill, Oleksandr Shemiatkin, said that the introduction of this tax for SMEs would encourage companies to split up and would not have the desired effect.